Just two months ago I visited Hiroshima for the first time. 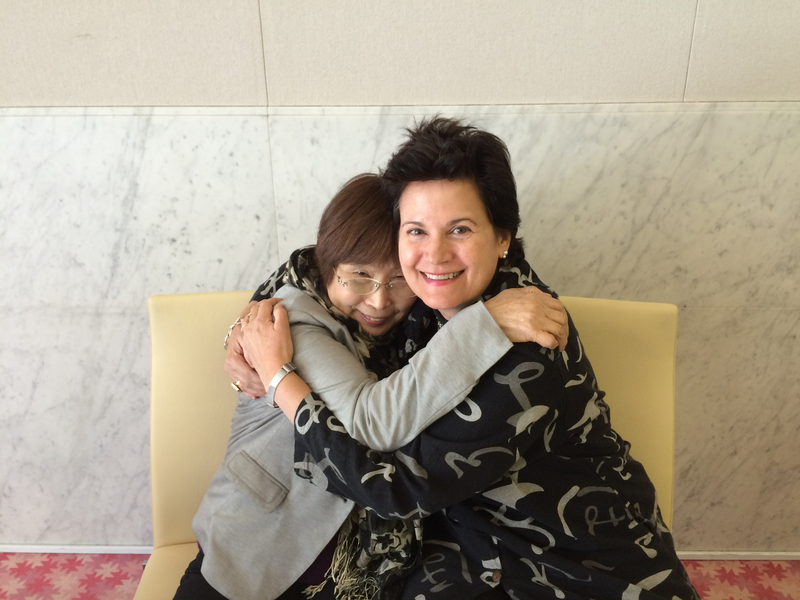 I met an atomic bomb survivor and we embraced as tomodachi. We called our moment, "The Hiroshima Hug." At last month's G7 Summit at Ise-Shima, I was in a part of Japan not readily featured in travel brochures. It has no hustle and bustle like global megalopolis Greater Tokyo, with its 35 million that make up over one quarter of Japan's entire population. It is not the ancient cultural capital Kyoto with its 17 UNESCO World Heritage sites. Mie Prefecture was once known as the breadbasket of the ancient Imperial Court. It has a gourmet heritage with a proud arts and crafts tradition. The Japanese people know Mie Prefecture well, and the Prime Minister of Japan was trying to get the world to know Mie better too by showcasing the picturesque coastline dotted by its many smaller islands where the bounty of the sea is some of the best in Japan. On Thursday, May 26, the first day of the G7 Summit, Mr. and Mrs. Abe accompanied the world's leaders and their spouses on a visit to the Shinto spiritual origin of Japan known as Ise Jingu (Ise Grand Shrine) where up to 10 million visitors arrive annually. This too was a strategic move to emphasize Japan's spiritual core at a shrine noted for its natural beauty and not national politics like that of Yasukuni Shrine in Tokyo that rattles nerves throughout Northeast Asia. The big story that came out of the G7 Summit was that nothing bad happened to cast off Japan's most treasured brand values, safety and security. The other big story was not connected to G7 at all. It was that President Obama traveled from Ise to Hiroshima to make his memorable 17-minute speech that called for a world free of nuclear weapons. An American president's unprecedented visit was to a city associated with Brand America's atomic bomb codenamed "Little Boy." Because of Obama's speech before nonagenarian hibakusha (atomic bomb survivors), it is clear that "Brand Hiroshima" will never be the same. One such hibakusha made global headlines. Sunao Tsuboi, age 91, told the "youngster" American president after his speech in what was reported as a fatherly voice: "You cannot hang out (waste time), as you are the Nobel Peace Prize Laureate." Obama's presence, along with that of Prime Minister Abe, signaled a new beginning for Hiroshima to distance itself from a 70+ year association with victimization, loss, and sadness. We must recognize the importance of Obama's visit to Hiroshima but not overstate it. Both anti- and pro-Obama watchers will use this occasion to their own ends. Going forward, Hiroshima needs to rebrand itself beyond Obama, just as Japan is branding itself beyond World War II. Scholars will continue to debate the ethics of the role that the atomic bombings played in Japan's unconditional surrender. We must never forget what happened in August 1945 at Hiroshima and Nagasaki. But the historic reintroduction of Hiroshima to the world is now a chance to say, "We remember, we will never forget, and that was then, this is now." It is time for the 20th century to step into the 21st, and Hiroshima can help us build that connection. Her words almost brought me to tears. She didn't want my forgiveness. She didn't see me as responsible. She saw me as I was to her as a young American citizen visiting Japan for the first time nearly fifty years after the end of World War II. It was possible for us to meet as tomodachi (friends). This symbolic act by a private citizen of Japan has stuck with me for nearly two decades. It guides my thinking today about the personal connection associated with peace and reconciliation. At the time of my first visit to Japan, I was in my first full-time job as a cultural affairs and educational exchange specialist, just months from earning a doctoral degree in international relations, but my degree did not focus specifically on Asia or Japan. I focused on peace and conflict resolution studies, US foreign policy and intercultural/international communication. The Prime Minister's Office of Japan had invited me to join 150 international youth in what was then called International Youth Village. We met with 150 Japanese youth who spent time with us teaching washi, the art of papermaking and origami, the Japanese art of folding paper, of which the most iconic global symbol is the peace crane. The peace crane is also the symbol of Hiroshima and the story of Sadako Sasaki, a 12-year-old girl who died in 1955 from leukemia associated with radiation illness after initially surviving the atomic bomb dropped less than a mile from her home near Misasa Bridge. Today's Hiroshima is as much about social entrepreneurship and start-up businesses, Made in Hiroshima products, and civic pride as it is about the story of Sasaki and the 1000 cranes. It is possible to accommodate both stories in our memory and search for meaning. Just two months ago I visited Hiroshima for the first time. I met an atomic bomb survivor and we embraced as tomodachi. We called our moment, "The Hiroshima Hug." It's my hope that many Americans and global citizens will have a chance to visit the modern city of Hiroshima and meet new friends as we all do our part for peace and nonviolence. Nancy Snow is Pax Mundi Professor of Public Diplomacy, Kyoto University of Foreign Studies, Japan. She lives part-time in Japan and part-time in upstate New York. Dr. Snow is the author/editor of ten books and frequently speaks about persuasion, nation and place branding. Reach her at http://www.nancysnow.com.